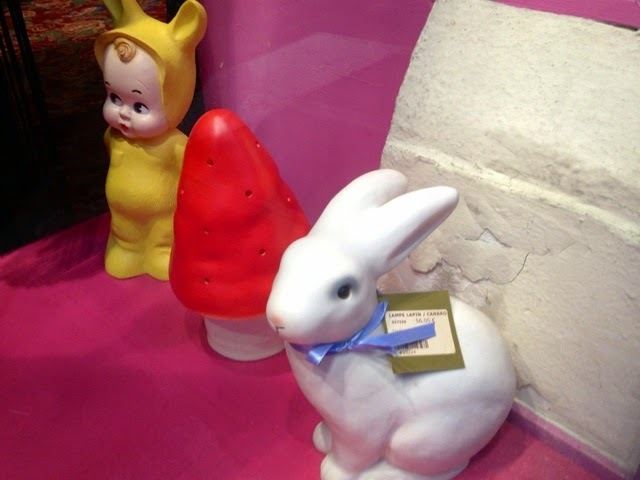 paris breakfasts: Les Lapins Chocolat sont arrivé! 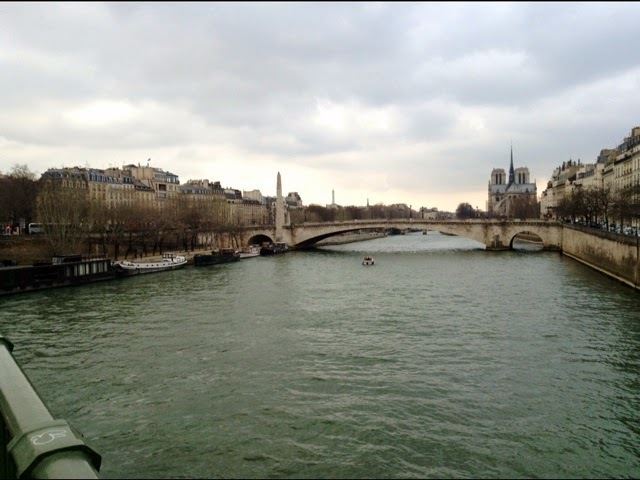 This past weekend in Paris was classic grey skies, chilly, overcast. Back came the woolie hats, scarves and gloves again. In planters for your balcon. In 2 euro bunches for general cheering up. Les asperges sont arrivé! A good sign Spring is around the corner. Les Lapins Chocolat sont arrivé! 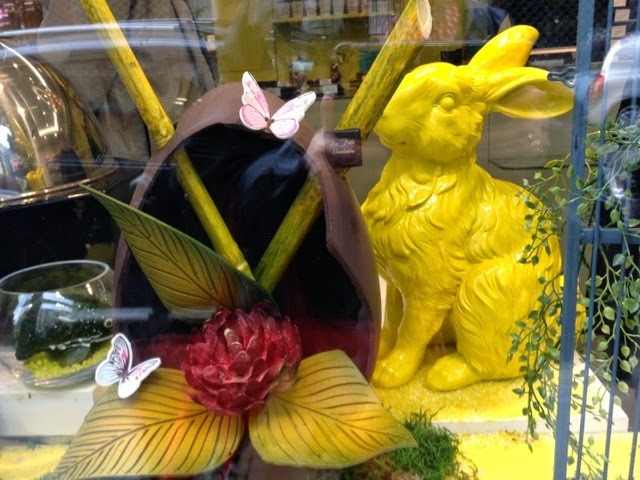 Bunnies grace all Paris chocolate shop windows. Many more to come. 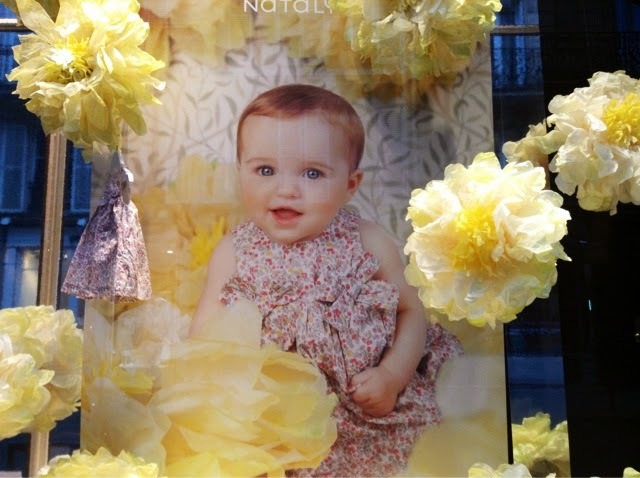 Les flower prints sont arrivé! 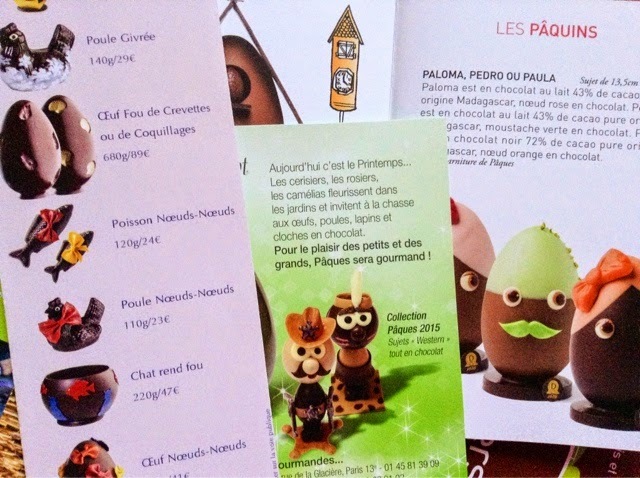 Les oeufs chocolat sont arrivé! Quelle surprise. 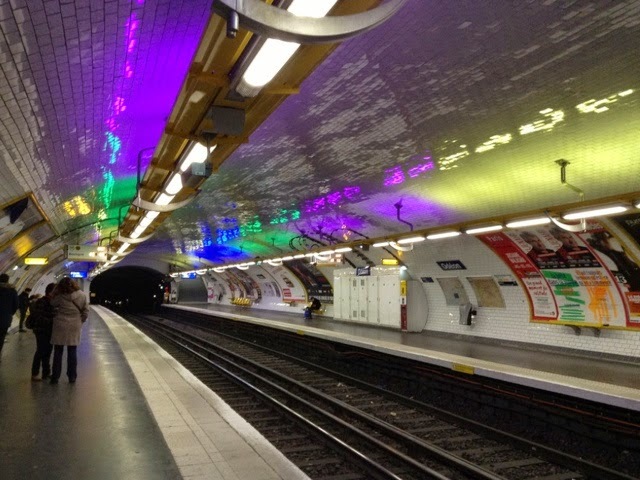 Easter egg-colored lights in Odeon Metro station sont arrivé! 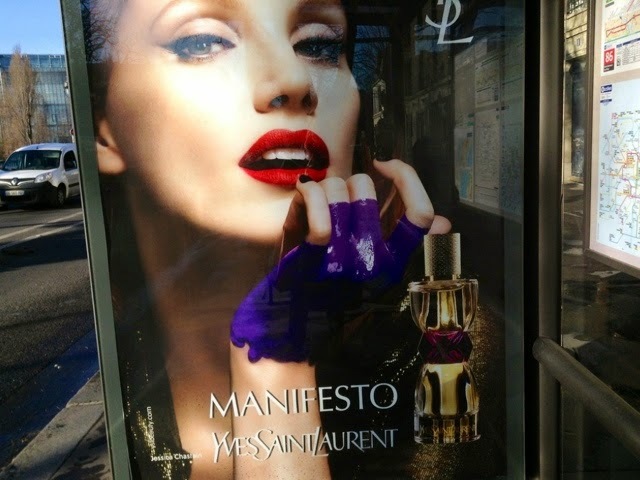 YSL says dip your hand in a can of purple paint for Spring. Oh sure. Then eat a matching purple(myrtille) dome. 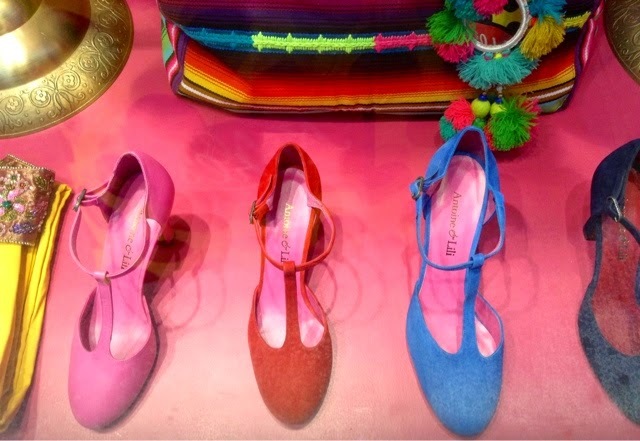 Les Shoes in Springy colors sont arrivé! 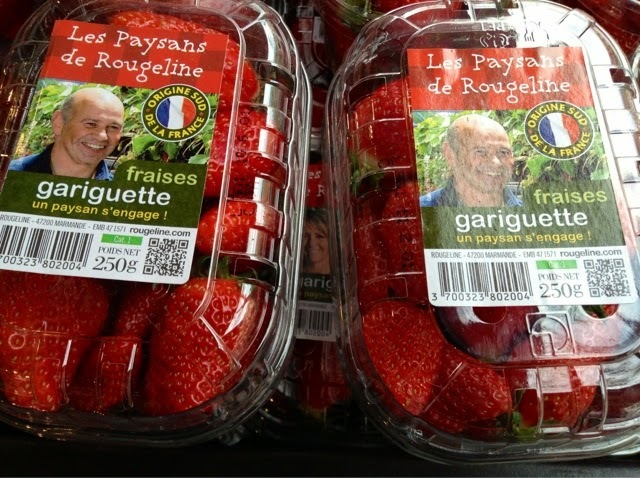 Les fraises est arrivé! But wait. It's too early to eat them. Les Lapins blanches sont arrivé! Les champignons et l'elf pour Printemps. 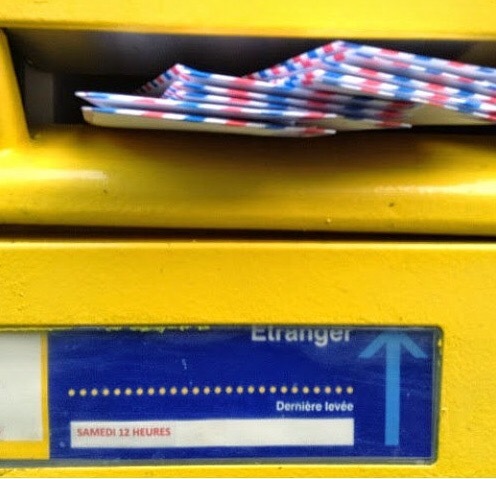 Les petites fleurs roses sont arrivé! 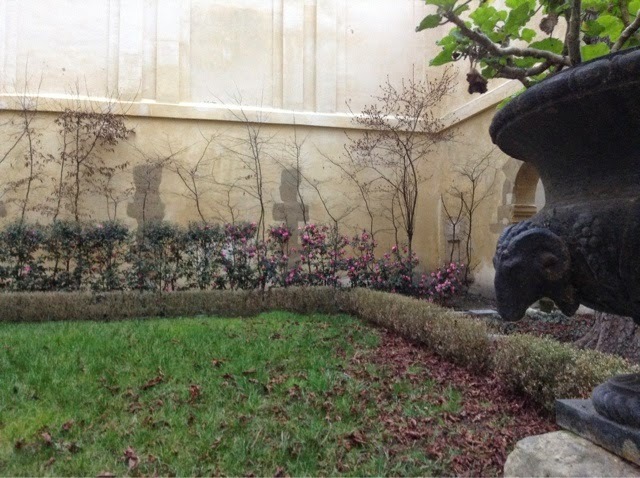 in our courtyard. Les souvenirs chocolats sont arrivé! 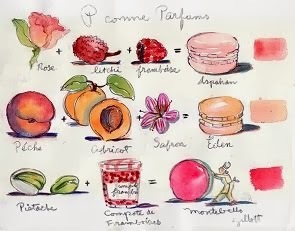 To put inside your April Paris Sketch envelopes. I wish I could send real Paris chocolates. So far I haven't seen a single bunny or a blade of real grass (except at Omnivore). Fingers crossed. *PS Charlotte's recipe links have been added HERE. Cloudy..grey damp cold here..Snowed last night..the end is near. 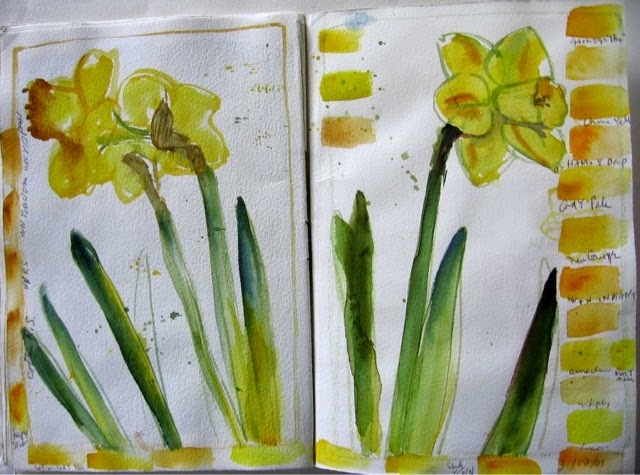 I have started thinking Easter..sprouting grass in my craft room.. making little bunnies..
Carol I even like the wrapping on the asparagus..
Read a grey book too..I expected a bit more humor for some reason...from the reviews..All My Puny Sorrows.Have you read it? I hardly noticed the face. The painted hand caught my attention but you are right for sure Monique. It is:) But no g.
I really love your photo of the river. It is very evocative. Lovely to see the first signs of spring in Paris!! You can say whatever you Like Cynthia. 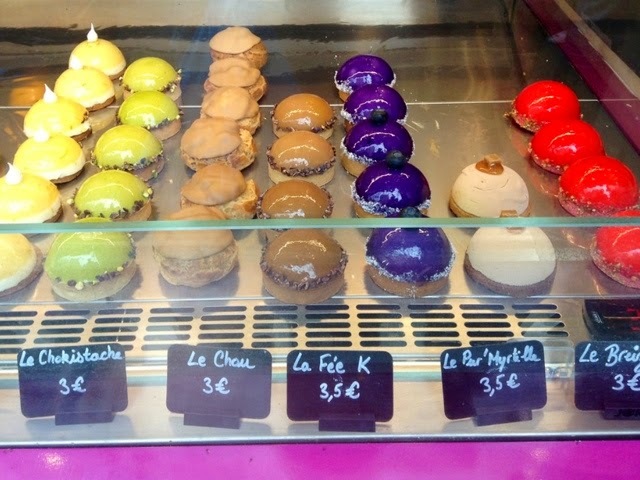 It's fun to share the beauty of Paris! 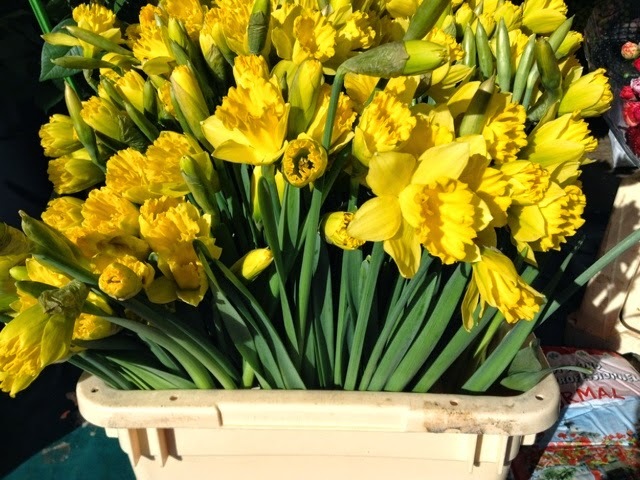 Spring is blooming here also! With our bees already loading up! Lapins, cadeaux, souliers, images,. oeufs, sont plurals. Ils SONT arrives. Il est arrive is singular. Merci bien. Pas la meme chose bien sur. All fixed now Anony. Thank you. Thats what I get for trying to use French hither and thither. Earlier someone was having a fit over my English grammaire but that's par for the course. Carol, I love your wit. 92 degrees here. We may not have Spring at all. Oh my goodness, Carol...what temptations you show us. Each one is delightful. C'est tres difficile to pick a fave. Those shoes! 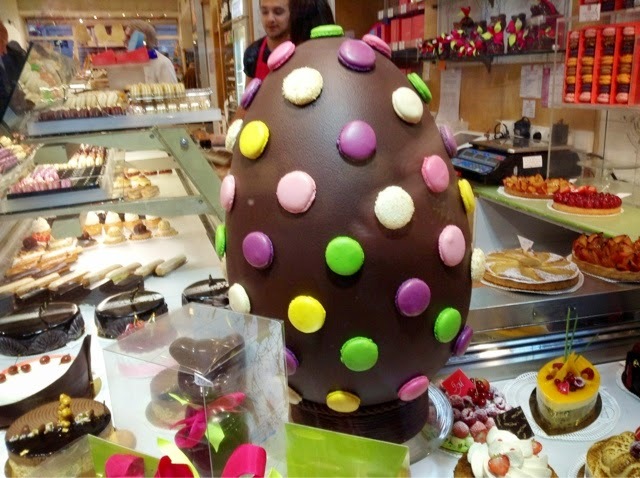 All that chocolate, particularly the giant macaron encrusted egg (Lent's almost over.) 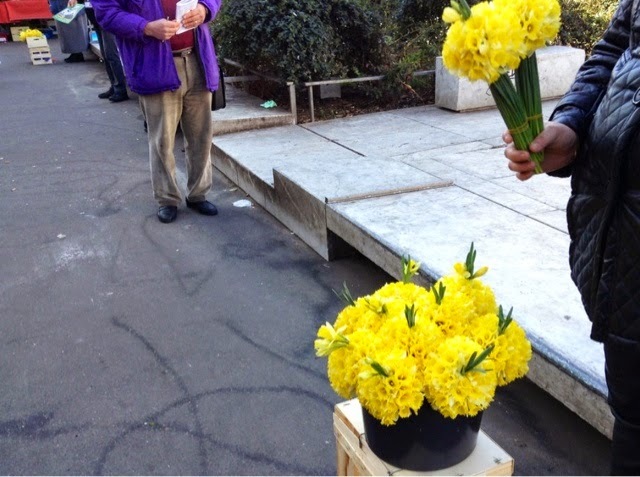 Les fleurs. I'm thrilled to report we are also seeing delicious asparagus and I have bought it. The Metro lighting is amazing...is it in just a few stations? Is it privately sponsored? Everything looked so marvelous - enen the somber & chilly looking Seine. Followed by such an explosion of color. 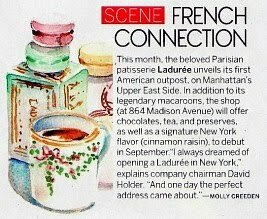 Can hardly wait to get to Paris. More eggs on the scene. 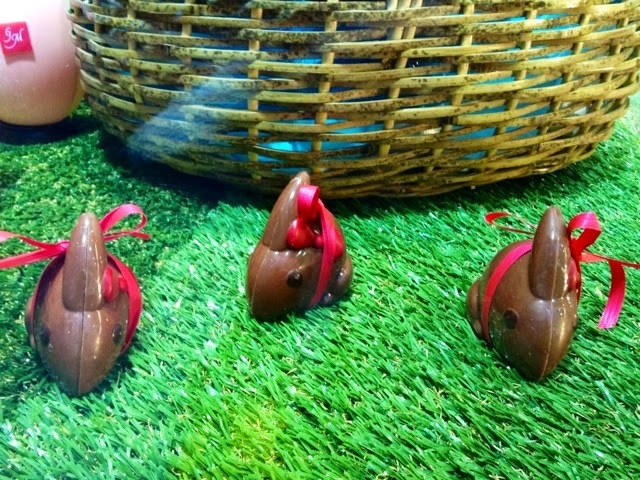 I'm back form a family wedding - and oh, so glad to see my favorite kind of bunnies - chocolate! Though I must admit, those asparagus bundles really set my heart to beating! So far, the aparagus in our markets is that ultra-think stuff that many people prefer...I like mine to be a bit meatier like th ones in your photo! Those are EARLY aspergus so not quite ready yet. But a nice sign of Spring. Thank you for not biting off my bunny chocolate heads Jeanette! Every March I long for Paris more than in the other months, because that's when I most often visited...The spring colors exploding & the sun & the eggs & candy & flowers & air & parks were such a contrast to Maine's wintry Marches..(though I have to admit, my Maine has it's own magic, just no quite as much in March.) 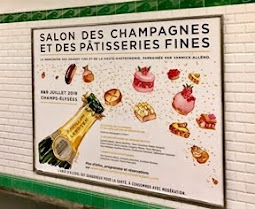 Sadly, due to the budget, I will have to miss Paris & Le salon du livre one more time, Carol, but I'm trying hard to get myself there next year. Will you go this year? 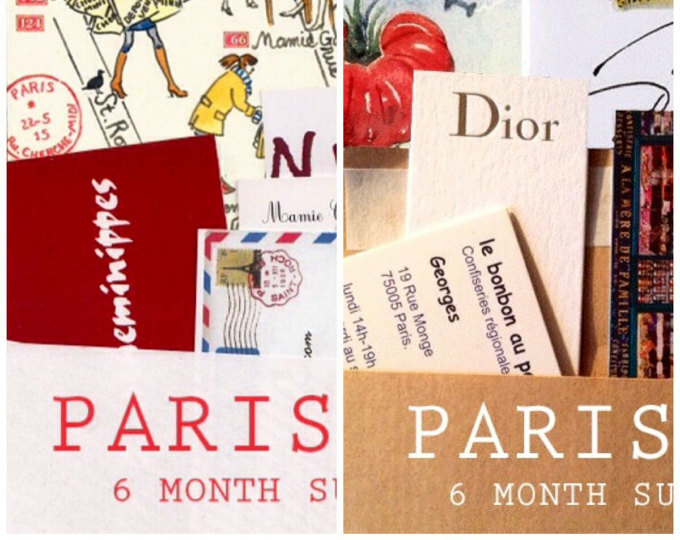 I guess I'll go read my Paris travel journals & dream ...My favorite of the above photos? Your painting, of course! Yes I am going though I shouldnt...Visa homework and taxes to do. Up to my eyebrows! Take care. Maybe next year you will be here. That opening shot is very grey and gloomy, but you sure start adding color in a hurry! The shot inside the Metro is a stunner - fabulous light & color - perfect! What an adorable Spring Fling! I love it! Thanks, too, for the recipe link to Charlotte. It even motivated me to find how to make chestnut milk...thank you Mother Earth! Why do you think it is too early to eat strawberries? The ones that I am buying here in Italy from Spain are pretty good. Way better than any from a grocery in the US. Also the asparagus? Do you think it will get better? 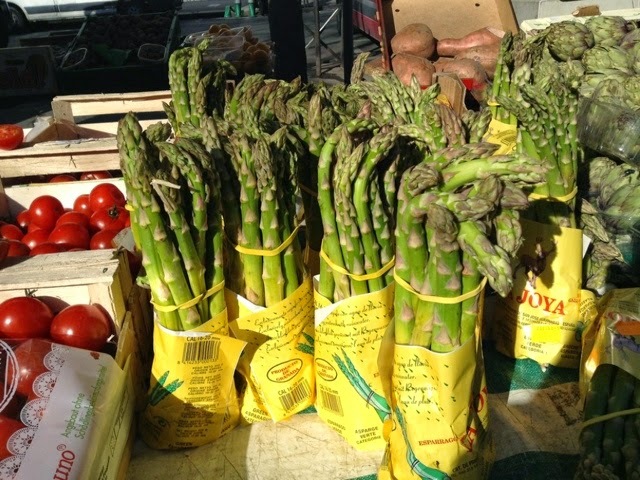 I am hoping to see Italian asparagus at the grocery today. How lovely to watch spring arrive after a Paris winter. And you have so many glimpses, and Easter is so soon now. How enchanting! 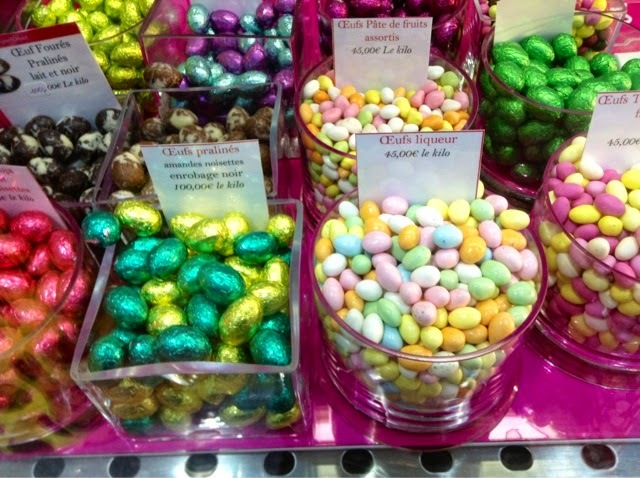 Oh, I do love the colors of spring, the lovely eggs and candies and yellow bunny and sweet treats. Yes, with all of that to gaze at, a little gray sky seems a bit less severe than it might have before!